By clicking the Add image button you can load disk image files. Note that it is the only place where you can do that. All image files must be loaded before the partition scan. Also you can specify that ReclaiMe Pro should work only with these image files ignoring all other devices – mark Scan images only, ignore physical drives. 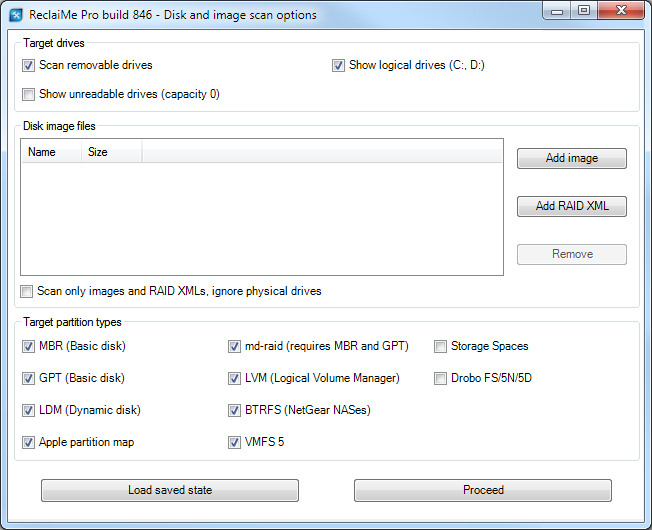 ReclaiMe Pro can create disk image files in different formats, and work with sector-by-sector (raw), vhd/vhdx, and EnCase E01 disk image files. The Add RAID XML button allows you to load a RAID XML file with RAID configuration parameters created either by ReclaiMe Pro or ReclaiMe Free RAID Recovery. Similar to disk image files, this is the only place where you can feed a RAID XML file to ReclaiMe Pro.